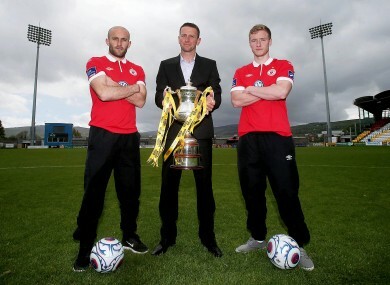 The Sligo Rovers defender is desperate to add the competition to his honours list on Saturday. Keane (left) with team-mate Paul O'Conor and Sligo manager Ian Baraclough at Tallaght Stadium yesterday. IN HIS FIVE years at Sligo Rovers, Alan Keane has won it all domestically. The 29-year-old full-back joined the Bit O’Red from Galway United in 2009 and played an important role as they clinched three FAI Cups (2010, 2011 and 2013), the league cup in 2010 and the Premier Division title two years ago. Until now, however, the Setanta Sports Cup has evaded Keane and Sligo. But having seen off St Patrick’s Athletic in emphatic style in the semi-finals, Ian Baraclough’s side have the chance to put that right by winning the All-Ireland competition for the first time when they meet Dundalk at Tallaght Stadium on Saturday. “A lot of the lads who are here have won the league, the league cup and the FAI Cup but we haven’t managed to win the Setanta Cup,” Keane told TheScore.ie yesterday. “For me personally, I’d love to get my hands on it because I have all the other medals bar the Setanta Cup. We’ve struggled to get into the final over the past few years and failed at the semi-final stage. Sligo struggled with their league form during the early stages of this season but are up to fifth in the table having turned their luck around in recent weeks. And Keane puts their change in fortunes down to hard work. “We were playing well but things just weren’t going well or clicking for us,” he adds. “We were coming in after games disappointed but the manager kept us going and believed in us. “He just said keep working hard and it will come so we did that on the training ground and eventually we got the breakthrough. Football is a funny old game. You could miss a chance from four yards or it can go in off someone’s shoulders like it did when we played Dundalk earlier in the season. You’re always going to go through a bad patch as it’s not going to go smoothly for the whole season. We’ve picked it up and come into fine form coming into the final, which is good. Email “Keane seeking a clean sweep of domestic medals with Setanta Cup triumph”. Feedback on “Keane seeking a clean sweep of domestic medals with Setanta Cup triumph”.